Home / Unlabelled / Common Core Math Standards: Worse for Our Kids and Millions of Dollars Wasted? Common Core Math Standards: Worse for Our Kids and Millions of Dollars Wasted? 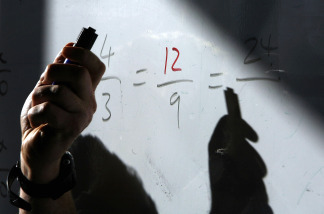 Common Core Math Standards: Worse for Our Kids and Millions of Dollars Wasted? - Hi, friend Climate and Weather Information, in this article entitled Common Core Math Standards: Worse for Our Kids and Millions of Dollars Wasted?, we have prepared this article well and concise to be easy to understand for you to read and can be taken inside information. hopefully the contents of the post that we write this you can understand and useful. okay, happy reading. A major decision is going to be made by this session of the Washington State legislature--one that will profoundly affect math education in our state and one that could cost the state tens or hundreds of millions of dollars at at a time when budgets are extraordinarily tight. This decision is flying under the radar of most of the media and many politicians. The decision? Should Washington State adopt the new "national" Common Core math standards produced by the National Governor's Association and the Council of Chief State School Officers, giving up our new and highly enhanced math standards adopted in 2008. This is important, so stay with me. A little history first. As described in numerous media reports and national studies, the performance of U.S. students in math is lagging that of students in many other nations. And I have certainly seen math deficiencies increase while I have been teaching at the UW. If we are to remain a leading technological nation this cannot continue. Now the reasons for this decline are really not hard to find, ranging from many teachers have insufficient knowledge in mathematics, poor math standards in many states, trendy new-age instructional ideas (e.g., "Discovery" and "Integrated" mathematics) in vogue in schools of education, and yes, issues of student discipline, motivation and family support. Recently, we have made substantial progress in our state, including the adoption of much-improved state math standards, the rejection of "Discovery Math" in many districts (e.g., Shoreline, Bellevue) and the acquisition of very good new books in some of these districts. There are, of course, some disaster districts, such as Seattle and Issaquah, who insist on retaining some of the worst textbooks and are providing their kids with an inferior math education. But overall, we are in a better place than a few years ago. Without any real regulatory authority to push these standards into local districts, the Obama Administration has dangled a large financial carrot in front of the financially strapped states--- hundreds of millions of dollars from the federal "Race to the Top" initiative. In fact, states have been so desperate that many have agreed to adopt the new Common Core math standards sight unseen and untested as part of their applications for Race to the Top (RtTT) cash. In a bid to get some of the RtTT money, Washington provisionally adopted the standards last year (Senate Bill 6696), and that the legislation allows our Office of the Superintendent of Public Instruction (OSPI) to adopt the Common Core standards if the legislature this year does nothing to stop it. In other words, we are going to go with Common Core if the legislature doesn't act this session to delay or stop it. Ironically, Washington State's application to the Race to the Top (RtTT) program was declined for a number of reasons, including our unwillingness to take on another RtTT requirement--adopting charter schools. So we have agreed to replace our new excellent math standards, standards given an "A" by the Fordham Foundation and adopted in 2008, with an untested new program, and we will get none of the funds we were after. But it is even worse than that--there are huge costs in switching to the Common Core standards. Moving to our new 2008 standards, the state spent over 30 million dollars in training over one year. Certainly, the switch to the Common Core standards could equal or exceed such costs. And what about changing millions of textbooks for nearly a million WA State students to be consistent with the new standards? Hundreds of millions of dollars? All of this in a state which is critically short of funds, where K-12 and universities are taking major cuts, and where the social safety net is being frayed by major cutbacks. Folks, this doesn't make sense. and plenty are a lot worse than this. On the other hand, our current standards have far greater clarity. (2) Common Core delays teaching many basic mathematical ideas, from essential mathematical operations to algebra. More problems are described in the links at the bottom of this blog. As noted above, there have been no pilots or tests of these new standards. No proof that they enhance student performance. Can you imagine pushing a new national math standard without insuring that students learn better with them? An extraordinary mistake. Assessments of new standards determine what will be taught and how it will be taught (we learned this to our sorrow with the ill-fated WASL!). Assessments for the new standards have not yet been created, so there is no way to evaluate this crucial component. There, of course, is a political dimension to all this. In essence it represents the transfer of local prerogatives on educational standards to a national entity, an issue of of concern to some. If the national standards and assessments WERE better, would we want to give up local determination of this issue? I wont debate that issue in this blog. In addition, it is not clear who will control the evolving Common Core standards. A number of people involved in the "reform" and "discovery" math movement are active in it--what if they gained control? Could this end up a huge national disaster? (1) We can continue with the adoption of the new, unproven Common Core math standards, standards that are inferior to what we have now. We will then be committed to spending hundreds of millions of new dollars on this transition...money we really don't have. If the legislature doesn't act, this is what will happen. (2) We can decide to wait. Stay with OUR new State math standards that are now in place, with all their advantages. Watch carefully and see if some of the Common Core issues noted above are resolved. Our State can remain engaged with national efforts, but we wait to see if Common Core evolves. I believe this is the only logical and prudent course of action. To do so, the legislature must take positive action to delay implementation of Common Core or revoke its adoption (this mean revocation of SB 6696, Sec 601, which passed last year). Thus, it is important that each of you contact your legislators to let them know you feelings on this critical issue. It is time for the Governor, Superintendent Randy Dorn, and leaders in the State legislature to show some leadership on this critical issue. And well-funded groups like the Gates Foundation and State business groups need to take a more informed approach. It is so frustrating that those with the power to deal with this issue, fall back on the same tired ideas and listen to the same educational consultants. Schools of Education are generally a big part of the problem, not the solution. It is perhaps an American deficiency that we jump for quick fixes, without taking the time to carefully determine and address the real core problems. The rush to push untested Common Core math standards on states around the country is a real symptom of our inability to solve our big problems. It is time to do better and we can do so in WA State by not joining the stampede. Some states, such as Texas, Virgina, Alaska and Minnesota have already declined to participate. There is no reason to rush into this and many reasons to wait. Thank You and Good article Common Core Math Standards: Worse for Our Kids and Millions of Dollars Wasted? this time, hopefully can benefit for you all. see you in other article postings.